The sound of a whistle nullified a big play. A few minutes later, it happened again. This continued at various junctures of the first three quarters, but then, St. Joseph’s Prep decided to do what it does best – hand the ball to senior running back D’Andre Swift. That decision, and a huge performance by senior defensive end Chris Lowndes, spurred the Prep to a 35-25 victory over North Penn Dec. 3 at Northeast High School. The win, played in front of a packed house on a chilly evening, maintained the Hawks’ perfect season, now at 13-0, and ended previously unbeaten North Penn’s campaign at 14-1. More importantly, the triumph propelled the Prep to the PIAA Class 6A state championship against Pittsburgh Central Catholic 8 p.m. Saturday, Dec. 10 in Hershey. The Hawks will try to snare their third state title in the past four years. To accomplish such a lofty feat, the Prep will probably need to play better than it did against North Penn. Although beating a rugged 14-0 team by 10 points is impressive, this was not one of the Prep’s better performances. Penalty after penalty – some arguable, but penalties nonetheless – thwarted huge gains by the Prep offense. Meanwhile, North Penn displayed the same amount of talent, hustle and mettle as its opponent, and with 27 seconds remaining in the third quarter, the Vikings took a 17-14 lead on a short field goal. Time, however, was of the essence, and that’s when superstars rise to the occasion. The University of Georgia-bound standout scored three touchdowns in the final stanza from yardage distances of 27, 12 and 1. In the first quarter, Swift had opened the scoring with a 28-yard burst. He finished with 268 yards and four touchdowns on 31 carries, increasing his five-game, post-season statistics to an amazing 921 yards and 13 touchdowns on 80 carries. “If you make a mistake, he’ll definitely correct it for you,” said senior offensive lineman Carter Lynch. Senior offensive lineman Jackson Evans agreed. 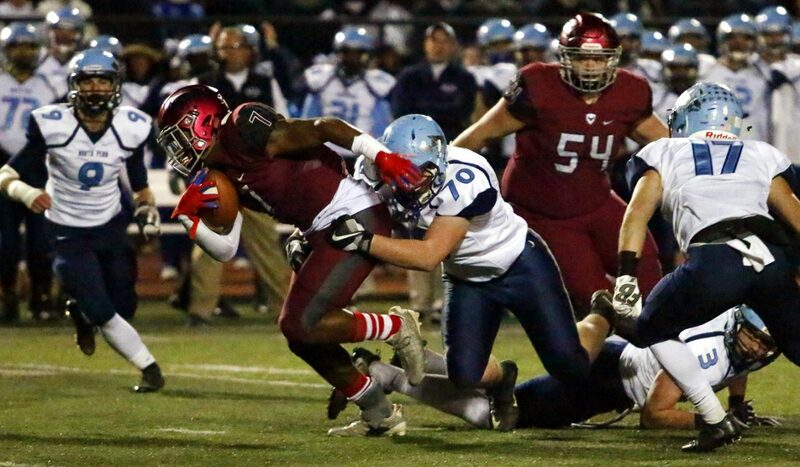 Although North Penn gave the Prep defense all it could handle, one player in particular, the aforementioned Lowndes, was, simply put, outstanding. With 9:33 left in the fourth quarter and the Prep leading, 21-17, Lowndes steamrolled a fourth-and-one North Penn attempt at its own 40-yard line, a play that eventually led to a Prep touchdown. Later, with North Penn down by 28-24 and driving with 3:05 left in regulation, Lowndes swiped the ball from the North Penn running back’s grasp and it was recovered by junior defensive back Dejuan Dandridge. A subsequent TD run by Swift sealed the deal. Dandridge lauded Lowndes for the forced fumble and the coaches for his fumble recovery.